Whether you’re re-decorating or furnishing a new house, making the most out of your space while creating a functional and beautiful home is no easy feat. Furniture buying can be tricky, and even harder still might be where to put it all and how to strategically arrange your rooms. This is where your furniture plan comes in and serves as one of the most important parts of your interior designing. Space planning is a fundamental element of the interior design process and the topic of our latest storewide workshop. Furniture spacing and placement is key to comfort, function, traffic flow, and laying out a room that fits your lifestyle. For furniture and a space that’s a perfect fit, we’re recapping the top tips and tricks from our last workshop to help you effectively arrange your furniture to suit your home. Arranging furniture is really an art from, but first and foremost all rooms are functional spaces where we live, eat, entertain, sleep, etc. If the room doesn’t meet its criteria for functionality, it essentially won’t matter how beautiful or well decorated it is. Having a space plan will help to define the circulation patterns that show how people will move through the space and use it on a day-to-day basis. Setting up your perfect space starts with the three fundamentals of space planning to maximize your home’s potential. What is the quickest pathway to those spaces? 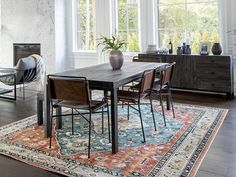 Once you’re able to answer those questions, your furniture should be placed in the spaces that don’t obstruct and disrupt the room’s natural flow of traffic. Leave several feet of space between furniture pieces and between furniture and walls or other barriers, and measure to ensure there isn’t an awkward barrier to the room flow. 2. How Do You Use Your Space? The smallest tweaks in flow and placement can make a big difference in the way a room feels and how you live in it. Think through what your natural steps are as you navigate your spaces on a regular basis and how those steps may be impacted by your organization of the space. Another thing to consider during this step is your room’s focal points. These could be windows, fireplaces, built-in units or doors. Think about how these focal points are balanced in the room and how you can add to the space to create harmony. The living room is a good example of different activities taking place in one space; watching TV, sitting by the fireplace, and reading a book by the window are just a few natural behaviours of the space. How you use your room will determine how your furniture is placed and positioned. If the fireplace is the focus of the room, the sofa might be facing it (option 1), but if the TV is being watched a sofa facing it would make the most sense (option 2). If both activities are important to your lifestyle and room, the sofa facing both the TV and fireplace would be the most effective placement (option 3). The dimensions of your furniture play a major role in creating a functional space plan and designing your room. Avoid furniture that is too large for your space or too small. Scale and proportion are not only vital for a space to make it aesthetically pleasing, but it’s also important to make the elements of any room work. A sofa that is too big will obstruct pathways, while a coffee table that is too small won’t be convenient to most of the seats in the room. Before selecting and purchasing your furniture, it’s important to plan your furniture with a scale drawing of your room using our Room Planner tool, or alternatively you can cut paper shapes to size and place them in the room to map out the most functional arrangement of your furniture and décor. Since space planning and furniture arrangement is a visual experience, our free-easy-to-use Room Planner program is an effective tool to help you plan any space in your home with virtually every piece of furniture available at Urban Barn. To get started, simple enter your room measurements with window and door elements, as well as any major fixtures like built-in units or a fireplace. Once you’ve re-created your floor plan, the fun begins as you place your furniture around your room. When you’re happy with your masterpiece you’re able to save your space, email it, or print it out and use it as your shopping list. Missed our latest workshop on space planning? Sign up to be on our UB Insider list to make sure you never miss out or check out our store events page to see what’s happening in a store near you! Browse our virtual store to see what’s new in store. See something you like? Click the tag to shop it online!